The topic of Website compliance with the American with Disabilities Act (ADA) is once again in the news. Government regulation is finally catching up with technology; businesses that were first impacted in their physical space by ADA Title III accessibility regulations will be some of the first ones faced with similar online accessibility concerns now. Those not in compliance may be risking litigation. Here’s why. In 1990 Congress passed the American with Disabilities Act (ADA), prohibiting discrimination against people with disabilities. A simplistic definition of disability can be defined as mental or physical impairment that limits major life activities. The Act covered a variety of areas regarding employment, transportation, communication, and public access. Title III of the Act in particular prohibited discrimination on the basis of disability in places of public accommodation, or as the ADA defines it, “businesses that are generally open to the public and that fall into one of 12 categories listed in the ADA, such as restaurants, movie theaters, schools, day care facilities, recreation facilities, and doctors' offices” as well as commercial facilities. Following the ruling, businesses complied, removing physical barriers that limited accessibility for disabled individuals. Government agencies and businesses added street curb-cuts, enhanced crosswalk signals with audio cues, built wheelchair accessible ramps, and added braille and other enabling features to public spaces and physical buildings. The focus was on removing physical barriers. Little, if any, attention was paid to the virtual/digital space, such as website. In 2010, the Department of Justice (DOJ), the enforcement body for the ADA, released an Advanced Notice of Proposed Rulemaking (ANPR) regarding disabilities and the online world. They acknowledged the public’s increasing use of and reliance on the Internet as a way to interact with and gather information on businesses and organizations and stated that they intended to add website accessibility as part of their interpretation of the ADA. After much public comment and research, The DOJ announced that final rulemaking on this topic will be delivered sometime in 2018. It is anticipated that DOJ will mandate a minimum web accessibility standard in adherence to World Wide Web Consortium’s (W3C) WCAG2.0 Level AA. So after a decade of delays, it appears that the subject of ADA website compliance may again be taking center stage even though an official ruling is still in the offing. The years-long delay in final ruling has opened the door to lawyers eager to cash in on the confusion surrounding ADA regulation interpretations. Encouraged by legal representation, plaintiffs (people unable to access what are considered public accommodation websites) are filing complaints. Interestingly, the NY Post notes that “Federal law bars ADA suits from winning damages — but lawyers are allowed to pursue collection of their legal fees, which can run as high as $25,000, or more…”. With attorneys being the only financial winners of the lawsuits, it puts into question the intent behind the complaint filings. Despite the reasons, the DOJ is receiving an increasing number of website compliance complaints and is acting on them. According to ADA legal experts Seyfarth Shaw, ADA Title III lawsuits continue to rise. In some instances, companies are starting to lose judgments and are being forced to make website updates according to the yet undefined regulations. In June, 2017 Forbes reported that Florida-based grocery food chain Winn-Dixie lost a first-of-its kind trial for ADA compliance. The courts ruled that Winn-Dixie must update their website to accommodate blind online customers and pay $100,000 to the plaintiff’s attorneys in legal fees. Winn-Dixie is appealing. A similar lawsuit is underway in California against Hobby Lobby. What Can You Do to Make Your Website ADA Compliant? Section 508 of the Workforce Rehabilitation Act of 1973 (amended 1998). Federal agencies have been subject to disability compliance for some time. They abide by Section 508. Although not identical to the expected ADA compliance regulations, it offers an ideal starting point. Health and Human Services (HHS) publishes a checklist for making files accessible. Of course, becoming familiar with W3C’s WCAG2.0 Level AA guidelines will also put you well on the path to compliance. The more you know, the better prepared you’ll be to adapt to upcoming regulation mandates. At the very least, companies should arm themselves with basic tools to deter litigation attempts and limit liability. The minimum. At a bare minimum websites not already subject to compliance should provide alternative ways of interacting with the companies they represent. Be sure to include a phone number so patrons can call and get information or interact with a live person. Add a statement informing visitors that you’re moving toward compliance and invite requests and input (via online form) on compliance features that are most important to them, and then work on implementing those concerns first. Preparing for screen readers. The American Foundation for the Blind recommends screen reading software to its members. According to them, “[s]creen readers are software programs that allow blind or visually impaired users to read the text that is displayed on the computer screen with a speech synthesizer or braille display.” For website owners/managers, adding more detailed HTML programming language to a website allows screen reading software to better perform or ‘read’ the site. SEO – more than just search results. Surprisingly, the better search engine optimization you have on your website, the more ADA friendly it is. For starters, be sure to include image alt tags so photos and graphics have a text description, add meta page descriptions to help orient visitors, provide full text transcripts for all pre-recorded audio, and include appropriately identified column and row headers on data tables. Be wary of keyword stuffing though. Writing alt tags with a human reader in mind is better practice than writing expressly for internet web spiders in search of key phrases. 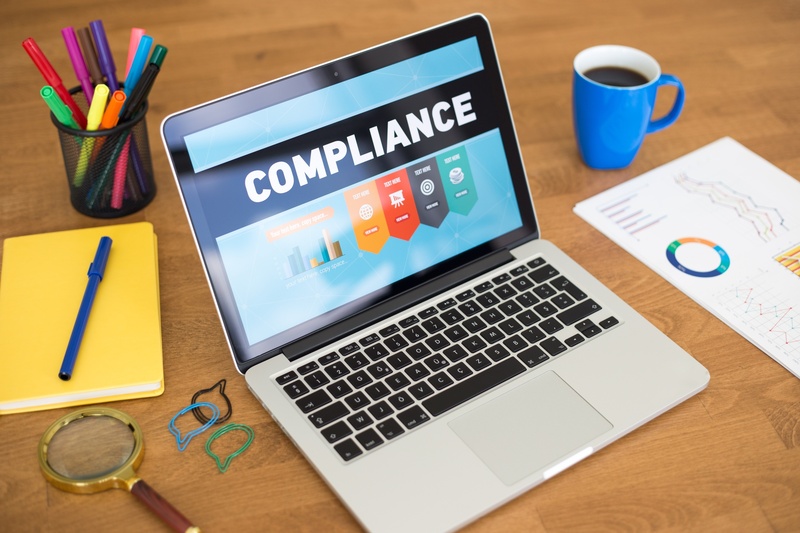 The good news is that over the years, web development (and CMS) platforms have been addressing compliance issues and including appropriate coding as part of their structure. Some web platforms are more predisposed to ADA compliance than others. Drupal, for instance, has long considered compliance important, including features like screen reader coding and SEO prompts in its version 7 launch in 2011. Drupal Version 8, released in 2015 adds aural alerts, more semantic HTML5 elements among other features to more fully extend accessibility. By design, Drupal has long been a natural fit when considering a website update, but others are catching up. In 2016, WordPress was made more accessible when it announced that it would be conforming to the WCAG 2.0 level AA guidelines. HubSpot also publishes compliance information to their customers that helps guide their customers on the topic. Coding alone cannot guarantee success, but it’s a great start. Human interpretation of compliance standards is still necessary to ensure content is perceivable, operable, understandable, and robust. Someone has to create the code, format content, build the features and then interact with it to be sure accessibility is attained. It is clear that having an ADA compliant website is important and matters a great deal. Companies that choose to forego compliance run the risk of losing customers and revenue. ADA compliant websites are a boon to business. They increase potential target audience, contribute revenue to your bottom line and uphold your reputation as a good corporate citizen. Given the political history of compliance, growing complaints against non-compliant websites and availability of software platforms that build it into the website coding itself, keeping your website updated may in fact be the best way to meet minimum recommended standards, and protect against potential litigation.